It will turn … black? Not so long ago, it seems like it was just a month (in fact it’s been three), we had tiny, very weak-looking tomato seedlings in the garden. Several of their siblings didn’t survive. Only one okra plant made it into the garden, despite the 5 or so sprouts that we had going on top of the fridge, in March and April. And yet, check out the softball-sized beast, above! It’s vine, held up by a peony cage, is almost as tall as I am. For awhile I fretted over the weeding that wasn’t getting done, around the vegetable plants, but now, so little sun is getting through those vines that weeds have little chance of germinating and growing, within them. I’m worried there are tomatoes in places that we can’t reach. We may have to hire a toddler to creep in and pick them! We’re doing winter squash (the Delicata variety) for the first time. It’s currently got some huge blossoms, and is creeping over into the tomato area. We’ll try and train it to crawl the fence, because its efforts to climb the weeds are just toppling the weeds. These plants are bizarre – I didn’t even realize they’d be climbers. The little tendrils are just so adorable – and yet strong (I’ll take help of any kind, with the weeding). Our composter is delivering us another treat this year, and again (it appears) in the form of a muskmelon or cantaloupe plant. It just started growing out of the soil next to the bin, and already has some lovely little tobacco-like yellow flowers. We’ll see how far that vine crawls – I’m imagining it may reach the driveway – but I’m very excited at the prospect of fruit! When it last happened, several years ago, the melon was deliciously sweet. However, it’s possible that it’s a pumpkin or other winter squash. Which would be pretty neat, too. I’ve never grown pumpkin, at least that I can remember. We do have our various tomato varieties mapped out in our garden journal. That said, we don’t have the rows labeled, and so as I peek in at the various bulbous green masses in that morass of vines, I’m checking every day to see color change of any kind (the stripes you see in that photo do count!). Part of me is worried that they’ll stay green forever, perhaps due to the density of the plot. But, more so, I’m excited to see some of the dark varieties, ones we haven’t grown before, start to turn color. 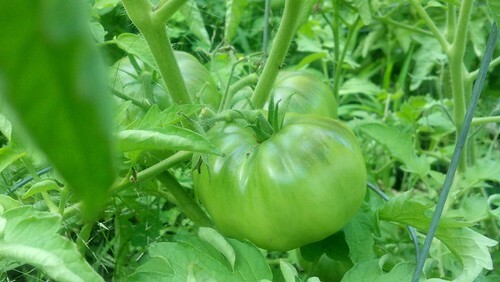 The one pictured at top looks like it may be a Black Krim or Black from Tula. We acquired a most stylish and comfortable set of patio furniture from my friend Mary Irene, and though we have no patio, our front porch is suddenly an oasis from the still and often hot air inside the house! We’ve crafted a cozy yet airy place to read, play cards, enjoy morning coffee, or beckon the strolling neighbors over for a chat. It’s weird that I consider this a nice surprise: I’m finding in this forty-somethingth year, I need more sleep. Whether it’s due to age, to the amount of exercise I’m getting, to the summer heat, to green smoothies (ha) or to anything else, I can’t get away with just seven hours each night, any more. I’ve been waking up, too tired. I’m surprised to find encouragement and relief, that my body is telling me to turn off the TV earlier, skip a morning workout, or take a nap, in order to keep it healthy. In one way, this is adding complexity to my schedule, but in another way, it’s simplifying it. It’s like a big hand has languidly bent a middle finger to touch the thumb, to flick me in the forehead. Idiot, just stop it. It’s too much. Sourdough! And instant yeast! While I am far from a master baker, I bake enough to think I know what I’m doing. That is, I did until I got some sourdough starter in the mail from King Arthur Flour. As I grew up, Mom kept some starter that yielded great pancakes. I’ve grown tired of the taste of chemically-raised cakes, so I wanted to try some sourdough. Little did I know that acquiring some starter wasn’t a whole lot different than having a packet of Amish Friendship Goo/Bread arrive at your desk at work! The only difference is that if you don’t bake something with the sourdough on a given week, you just toss some of it. What it has also brought into my life: the possibility of a fresh yeasted bread in the house, every week. Knowledge of a different kind of yeast (instant) than the packets I’ve always bought. A little jar of goo in the fridge that looks a little different (mostly in quantity) each time I see it in the fridge, midweek. Some great waffles. Some too-dense bread. The possibility of making some pizza dough, next weekend. Other mysteries unfold, as well, and I hope they keep coming. What mysteries or surprises has this summer revealed, for you?